Welcome to the 2014 Kentucky Derby. There were showers this morning and the forecast is for showers next Thursday, Friday, and Saturday. I just thought I’d get that out of the way so you can get an early start on your mud handicapping and begin moping over another wet track Derby. So, get it out of your system now and hope the forecast is wrong. OK, on to more pleasant things, like the first look at Derby horses in the flesh. The first horse I observed this morning was Candy Boy, who was out when the track opening under the cover of darkness. 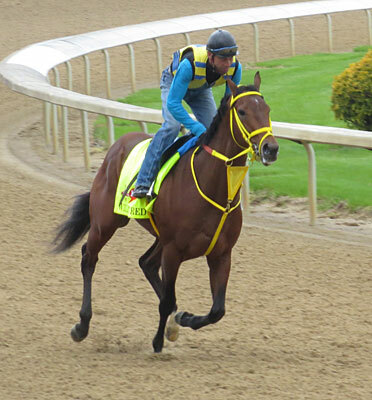 This is a big strapping, powerful-looking colt, and judging from the way he galloped second time around of his 1 1/2-mile gallop, he has already taken to the track. He was reaching out beautifully and hitting the ground with conviction. 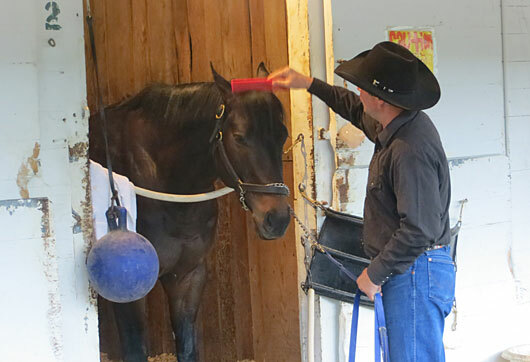 Because of overnight showers, trainer John Sadler wanted to get the son of Candy Ride on the track while it was good and tight. Unlike his California compatriot, California Chrome, Candy Boy will have a work over the track tomorrow, and this is the only hope several of the trainers have of beating the California comet – that he won’t have a work over the track, and just maybe he won’t take to it the way he has the quick surface at Santa Anita. Also, there is the abundance of speed that he could conceivably get caught up in or getting outrun and having dirt kicked in his face. 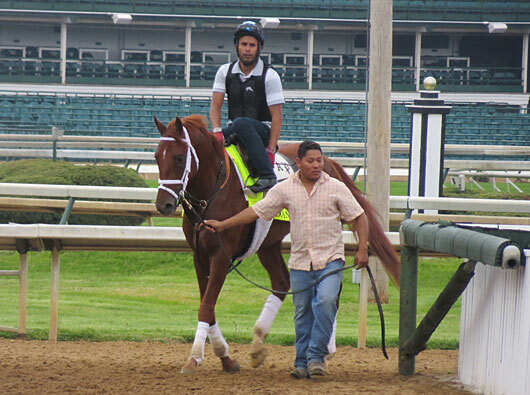 You can get tell a lot of the trainers are looking for reasons to go into the Derby with a ray of optimism, because they feel if California Chrome takes to the track and has a good trip, they’ll all be running for second. 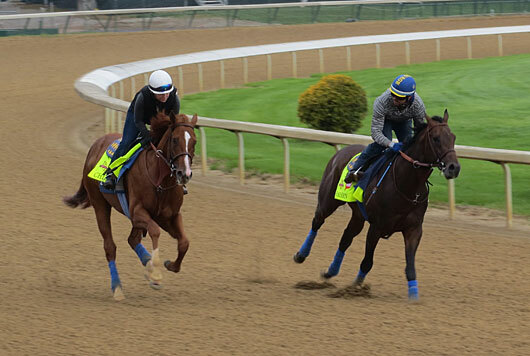 Now, let’s just suppose there is a freak in the Derby field and it’s not California Chrome. That brings us to Danza, who is not being ranked highly in the experts’ polls, with many people believing the grade I Arkansas Derby was more of a fluke and that the son of Street Boss will not be able to duplicate it coming back in three weeks. But seeing the colt in the flesh for the first time and watching him gallop, the stronger the possibility that it was not a fluke and that the horse is quickly blossoming into something special. Powerfully built and just an overall handsome individual, Danza was very strong in his gallop this morning. He was down into the bit and moving along at a good clip. Overall, this is the looker of the field, so who knows how good he is right now? He definitely is the unknown factor with the potential to be anything. Danza’s stablemate Intense Holiday is starting to get some buzz, and it was encouraging to see him gallop correctly this morning without crossfiring…or getting his front and back leads out of sync. All efforts are being made to correct him of that problem and the latest appears to be working. So, if you take that into consideration, along with his strong Thoro-Graph numbers and Brisnet late-closing figures, there is a good chance we’ll be seeing the Intense Holiday of the Risen Star Stakes instead of the one we saw in the Louisiana Derby, in which he still received a strong enough Thoro-Graph figure despite blowing any chance of winning the race. 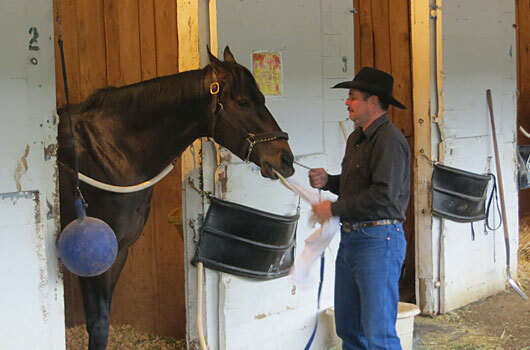 It was fun spending time at Billy Gowan’s barn and visiting with Ride On Curlin for an extended period of time. 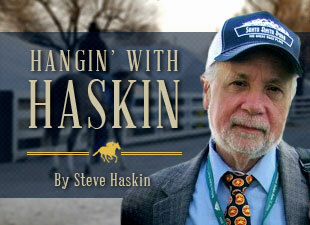 This is the place to hang out at the far end of the Churchill Downs backstretch. 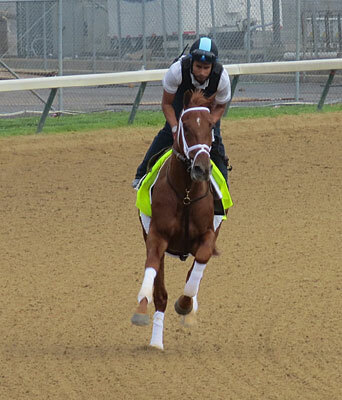 The son of Curlin is quite a character, but you have to be careful around him, as owner Daniel Dougherty’s 13-year-old daughter found out one morning before the Arkansas Derby. 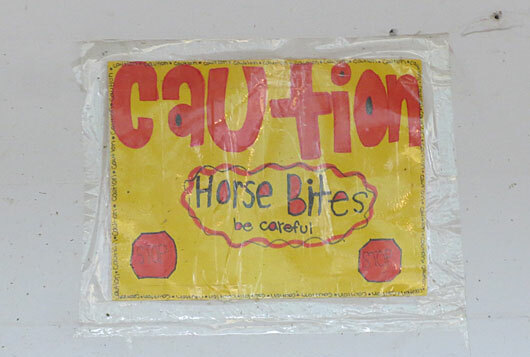 The instant she turned away from the colt, he nailed her on the upper arm, which prompted her to make up a sign, reading “Caution…Horse Bites…Be Careful,” which now hangs outside the horse’s stall. 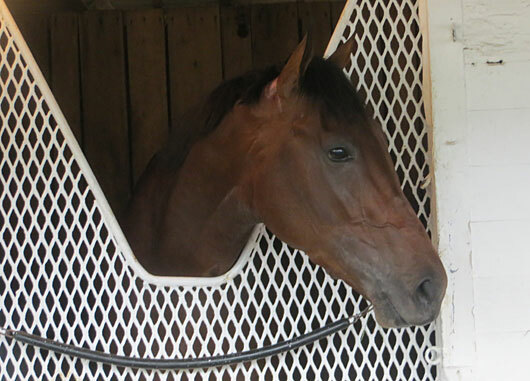 The feel-good horse of the morning was Hoppertunity, who was out before the 8:30 Derby training time slot. The son of Any Given Saturday was frisky and bouncing around, and tried to unseat exercise rider Dana Barnes coming off the track. He looks great physically, and reminds one of those tough “hickory” horses you used to see years ago. Baffert galloped his pair of Bayern and Chitu together. The latter will head straight into the Derby, while Bayern runs in Saturday’s Derby Trial Stakes. While a victory would not give him any additional points, it would give him sufficient graded earnings to jump into the 19th spot ahead of those with whom he is tied with 20 points. But right now Bob Baffert isn’t thinking past Saturday night. He’ll start thinking Derby after he sees how the colt performs. Also out for gallops this morning were General a Rod, Wildcat Red, We Miss Artie, Harry’s Holiday, Tapiture, Vinceremos, and Medal Count. Trainer Dale Romans is extremely confident in Medal Count, feeling the colt’s last two poor efforts on dirt were a result of immaturity. He says the son of Dynaformer has made great strides and is a far more mature horse now than he was earlier in the year and definitely last year. Let’s remember, he was very impressive in his career debut on dirt when he exploded late to win by over six lengths at Ellis Park.